Eric Kennington was one of a small number of artists to be employed as a British official war artist in both world wars. Having established his reputation during the First World War, he was an obvious choice to work again as an official war artist in the Second. Kennington was employed by the War Artists Advisory Committee (WAAC), the body that oversaw the British official war art scheme, from December 1939. In 1940 he was 'adopted' by the Air Ministry, particularly to complete portraits of RAF personnel. Battle of Britain fighter pilots were among his first subjects. 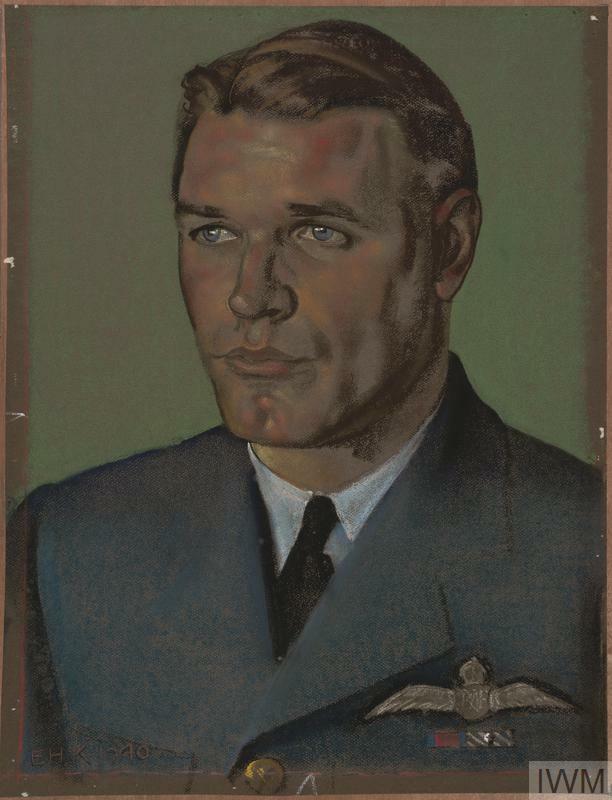 Kennington's vivid style of portraiture, using boldly applied pastels, very much suited what the Air Ministry aimed to achieve. Kennington's strident approach reflected his admiration for the actions of his subjects, sometimes giving them an air of Hollywood glamour. His pilots and air crew often possess a youthful handsomeness or a steely gaze, resplendent and dashing in blue RAF uniform. This helped to reinforce the image of RAF personnel, and particularly Battle of Britain fighter pilots, as self-sacrificing heroes - one that the Air Ministry was keen to promote. 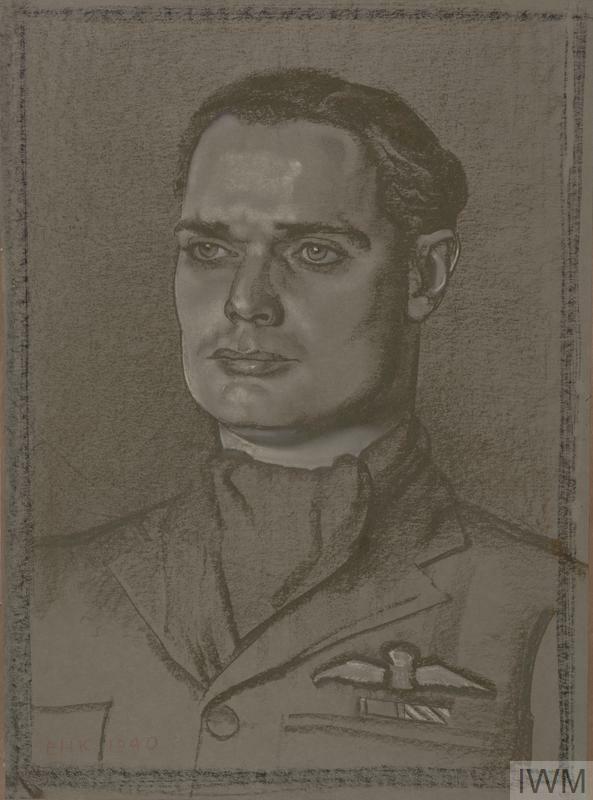 Kennington produced over a hundred RAF portraits before resigning his commission in September 1942. A book reproducing 52 of them, Drawing the RAF, was published that year. Kennington's depictions of RAF personnel were influential and reinforced the concept of fighter pilots as the knights of the air. Squadron Leader A G Malan DSO and Bar, DFC and Bar, 1940. Adolph Malan was one of the leading Allied fighter aces of the Second World War. Born in South Africa, he was commissioned as an RAF officer in 1937 and by the time of the Battle of Britain was already an experienced fighter 'ace'. Having flown with 74 Squadron RAF through his entire career, on 8 August 1940 he was promoted to lead it at the height of the Battle of Britain. Under his command, 74 Squadron claimed to have shot down 38 enemy aircraft on 11 August alone. Kennington depicts Malan as a brooding and masculine man of action, staring fixedly into the distance. Malan's character as a determined pilot and leader, and a strict disciplinarian, appears evident in his portrait. Squadron Leader A G Malan DSO and Bar, DFC and Bar, 1940, by Eric Kennington. Squadron Leader D R S Bader DSO DFC, 1940. Douglas Bader is one of the most familiar figures of the Battle of Britain. While he had two prosthetic legs, having lost both in a flying accident in 1931, Bader still rejoined the RAF upon the outbreak of war. He commanded 242 Squadron in 1940, flying missions over France and during the Battle of Britain. Bader was decorated both for his personal actions as a pilot, becoming a fighter 'ace' in his own right, but also for his leadership of his squadron. While Kennington portrays Bader in monochrome pastel, unlike the vivid colours of many of his other portraits, he still conveys Bader's personality. With his artfully arranged cravat and fixed expression, Bader comes across as the strong-willed and forthright individual he was known to be. Squadron Leader D R S Bader DSO DFC, 1940, by Eric Kennington. Squadron Leader R A B Learoyd VC, 1940. As well as Battle of Britain fighter pilots, Kennington also portrayed a variety of other RAF personnel. 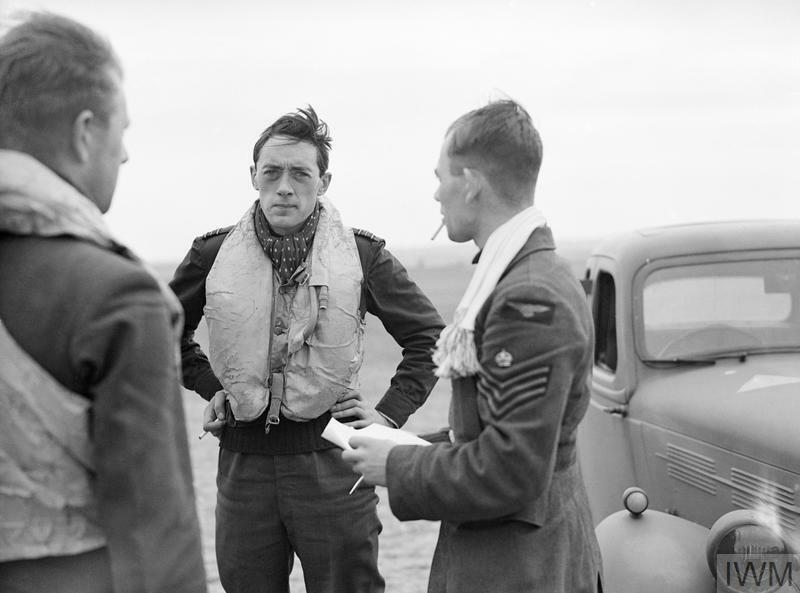 Roderick Learoyd was a Bomber Command pilot awarded the Victoria Cross for flying his Hampden bomber in a dangerous raid on the Dortmund-Ems canal on 12 August 1940. Kennington drew him less than a month later in the gallery at the top of the Air Ministry in London. During the sitting, a German air raid began and Learoyd was asked if he wanted to go to a shelter. After getting up and seeing over a hundred German bombers overhead, he commented, 'What rotten formation' and sat back down. Showing Learoyd staring directly at the viewer, his face almost glowing, Kennington captures this spirit. Squadron Leader R A B Learoyd VC, 1940, by Eric Kennington. Captain W Mohr: a Squadron Commander of the Royal Norwegian Air Force serving with the RAF, 1942. In May 1940 Wilhelm Mohr left his native Norway for Britain, hoping to continue his wartime service as a pilot despite the fall of his country to Nazi occupation. From Britain he was sent to Canada, spending a year as a flight instructor at 'Little Norway', a training camp for Norwegian pilots. From mid-1941 Mohr served as a pilot with the RAF and from April 1942 took command of 332 (Norwegian) Squadron, the second Norwegian squadron in the RAF. It was during this period, when based at North Weald in Essex, that Mohr was the subject of an Eric Kennington portrait. The vivid, almost luminous, colours of Mohr's face set against a bright green background seem to heighten the sense of Mohr's youthfulness - he was in his mid-twenties at the time. Kennington's portrait shows the multinational composition of the RAF, but also the continuity in the kind of men that flew with it. Captain W Mohr: a Squadron Commander of the Royal Norwegian Air Force serving with the RAF, 1942, by Eric Kennington. Sergeant M Eriksen of the Royal Norwegian Air Force serving with the RAF, 1942. 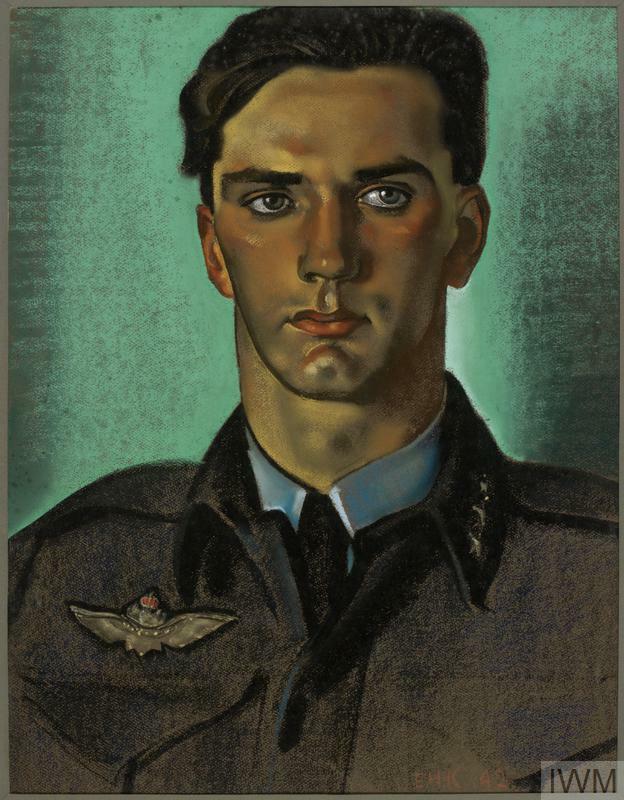 This portrait of Norwegian pilot Marius Eriksen perhaps typifies both Kennington's approach and the Air Ministry's preferred imagery of its personnel. Like Wilhelm Mohr, Marius Eriksen left Norway for Britain and underwent training at 'Little Norway' in Canada before operational service. He began to fly Spitfires with 332 (Norwegian) Squadron in 1942 under the command of Wilhelm Mohr, becoming a fighter 'ace' before he had turned 20. Kennington depicts him as if ready to fly at any moment, wearing a life jacket and a polka-dotted cravat. Kennington emphasises Eriksen's artfully arranged blonde hair, Hollywood-like looks and film star pose, creating the epitome of the wartime fighter pilot. Eriksen was a talented youth skier in peacetime, became a bold fighter pilot and after the war appeared in films, so his personality tallied with the imagery. Sergeant M Eriksen of the Royal Norwegian Air Force serving with the RAF, 1942, by Eric Kennington.